Peter Baker of Booktown Richmond in the reading room of Die Richmond Supper Klub. The current boom in Karoo books is a bit of a Gold Rush, with publishers big and small bringing out everything from down-home cook books to pictorial coffee table specials by legendary photographers. 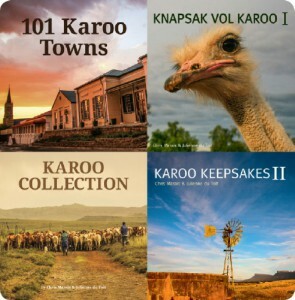 By all reports, Karoo book sales are excellent and the variety of subjects covered is growing every day. Which is wondrous news for readers and travellers who have been befuddled by the Great Nothing, the Incredible Blasted Heath, the seemingly empty space between Bloemfontein and Cape Town that they cross at least once a year in their quest for the quintessential bucket ‘n spade experience on a patch of our coastline. Now there are all manner of publications that tell you who lived here, what antediluvian creatures lurked in its flat lands, how to prepare a legendary lamb chop, what the different Karoo bossies are all about, the significance of this San rock engraving, what that memorial means, who died here in the Anglo-Boer (South African) War, whose great-granddaddy climbed off the boat in Algoa Bay and why that daft French explorer Francois le Vaillant swanned about with a baboon called Kees. A dedicated book fan scans the shelves in one of Richmond’s bookshops. 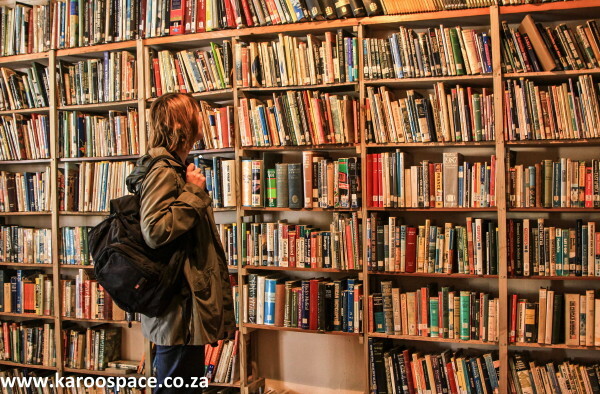 The Karoo even has its own Booktown (Richmond) where the Bookbedonnerd Festival is held in October every year. Then there’s the Schreiner Karoo Writer’s Festival in Cradock every July or August. The dry climate is great for preserving paper and the open horizons inspire authors. Just in case you wanted to know why we’re all in a flap about the shale gas fracking issue, you should read the various books on our rivers and our geology and then you’ll understand how precious Karoo water is to the whole country. Next time you’re in the Colesberg area and you see a distant donkey cart bearing a little family huddled together against the winter chill, you’ll realise these are possibly the First People of the Karoo. That because you might have read the book on the so-called karretjiemense. 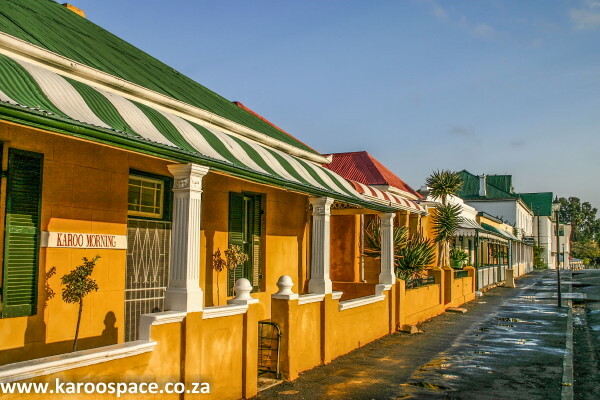 When you’re walking down the main road in Prince Albert wondering which house to buy, take some time to look at the various architectural shapes that make up a Karoostyle house. There are books on that, too. Nieu-Bethesda is a great little village to go book-hunting in. The story of Helen Martins and her Owl House in Nieu-Bethesda is another case in point. If you’ve seen the play or read some of the books on her life, those cement figures out in the yard and off-beat décor in the house all make sense. Karoo books are not merely historical. There are also some very handy ones in circulation. If you’ve read a selection of the excellent cook books (a major Karoo book genre these days), you’ll know your way around a Karoo butchery and by nightfall some choice cuts will be sizzling on the braai. More and more bikers are streaming into the Karoo, for a weekend or a long road trip. Many of them have little knowledge of the challenging back road routes available. Yes, there are books for bikers in the Karoo. Exposure to these books and time spent in the small dorpies and on the heritage farms from Springfontein to Somerset East, Calvinia to Cradock, will eventually give you what we call “Karoo Eyes”. You’ll know your Climax from your Aermotor, your Twee-tand Merino from your Dorper lamb, your anker karoo from your kapokbossie, your sandstone from your ironstone and your Aga from your Esse. You’ll know where the British soldiers lie buried, where Boer women and children were interned, where the old ghosts roam, when the UFOs came to visit, how lesser kestrels fly from Kazakhstan to roost in our giant bluegums and why blue cranes like to hang out with sheep in the veld. 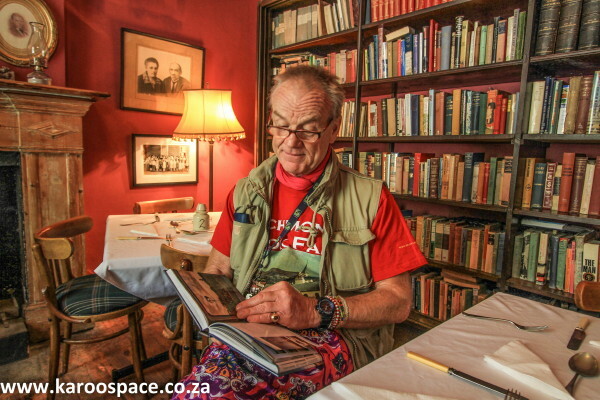 Die Tuishuise of Market Street, Cradock – check out the Victoria Hotel on the corner for their book selection. Most importantly, you’ll have a new sense of wonder about the Karoo. And then you’ll come and visit us. The best fun to be had is driving around the Karoo on a Book Safari. If you’re heading south from Gauteng, the first one would be Oom Japie se Huis in Philippolis, southern Free State. Then there’s the lovely Dustcovers in Nieu-Bethesda and, nearby, the prime bookshop in the region: McNaughton’s of Graaff-Reinet. South of that is Aberdeen Books and Crafts. Don’t miss the eccentric bookshops of Richmond off the N1, or the brand new Montagu Bookshop on the R62. But the Book Safari doesn’t end here. In fact, it’s hardly begun. 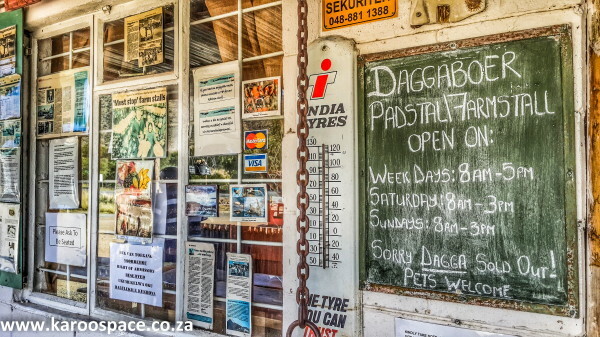 Daggaboer Padstal on the N10 – sells slippers, preserves and books. No dagga today. That’s because, you see, most of us who live in the Karoo have to develop a number of little enterprises, different income streams, to survive in the small towns. 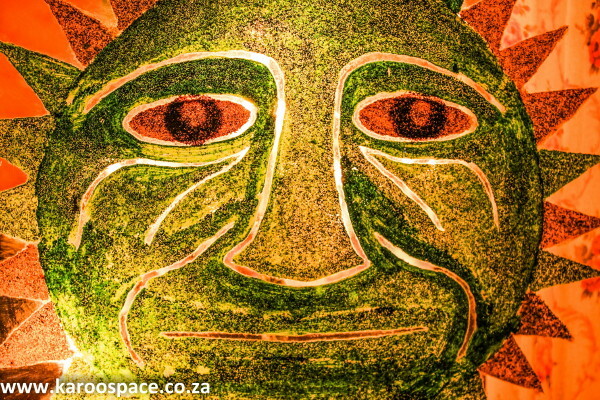 So you’ll find Karoo books in some of the most unusual spots. A good padstal is a cave of wonders. There, nestled in amongst the preserves and the hand-carved walking sticks, could be the very tome you’ve been searching for. Antique shops in the little towns also stock special Karoo books. Some of them come from the major publishers, but most have been produced by the independents. And they’re often the real gold. A small-town historian produces a lively account of his dorpie, a farmer’s wife and her friends show you how to work venison, a Port Nolloth diver brings out a rough diamond of a book about his life under the waves and a Richtersveld prospector tells of his days along the Orange River. All of it is magic. Pure magic. We know a farmer called Blackie de Swardt, of Prior Grange near Springfontein, southern Free State. He’s a good farmer, a keen sportsman and an Anglo-Boer War historian who has published 963 Days at the Junction, a detailed account of the war in his district. He’s a dark horse, indeed. 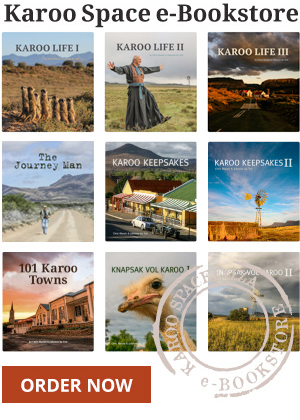 Chris Marais and Julienne du Toit have published Karoo Keepsakes I and II in print. They’re on sale HERE and in many unusual Karoo bricks and mortar outlets. 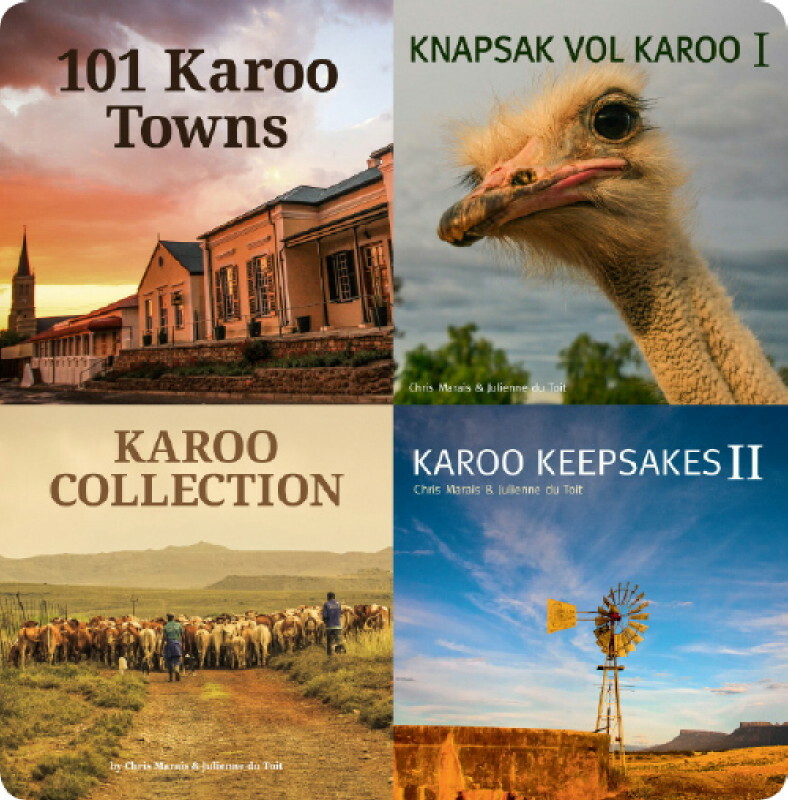 They also sell a variety of illustrated e-books on the Karoo from HERE, designed for mobile devices as traveller’s companions.